A crown, also known as a “cap”, covers the entire tooth surface restoring it to its original shape and size. It is custom made to fit your bite and color of tooth. A crown protects and strengthens tooth structure that cannot be restored with fillings or other types of restorations. 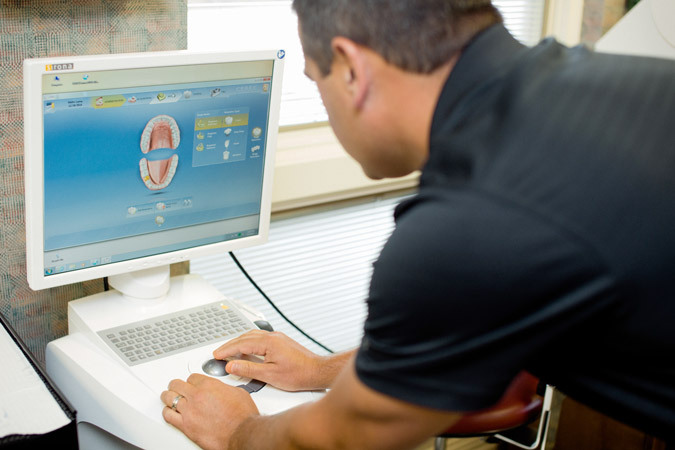 At Fox Family Dental we invested in technology that fabricates a crown in one appointment. It takes less down time from you, no goopy impressions to bite into, and no waiting 2 weeks for a permanent one while wearing a temporary crown. You leave with your brand new custom made crown to fit your bite and smile. There is no additional charge with this advance technology of the one-day crown vs. traditional crown. The process starts with the dentist using a wand with a camera on the end that uses reflected light to create a three-dimensional picture of the tooth and adjacent teeth. The software allows the dentist to recreate your natural anatomy. A mouse click sends the design to the milling machine, which sculpts the tooth from a small block of ceramic. Bridges consists of two or more teeth. They are a means to replace a missing tooth or several teeth. There are several different types of bridges, but the most common bridge prepares the teeth on either side of a missing tooth. The bridge is bonded into place restoring natural dentition. It is permanent and will need to be cared for with the same care as all the other teeth. Brushing, using a floss threader and a waterpik to clean under the bridge will help maintain the integrity of the bridge for years to come. "I grew up going to Dr. Bob Fox and always enjoyed it. His assistant Laura always made it fun and took great care of me. Hygienists are always informative and thorough. Now my kids are going there. They love it and it is always great to see the friendly faces and happy smiles that I grew up with. Thank you Dr. Fox and staff." "My husband and I started going to Dr. Bob Fox in 1979. Our children saw him as they grew up, and now their children (our grandkids) do, as well. From the clerical/ins. staff to the hygienist to the "dad/son" dentist team, we are Crazy 'Bout Our Foxes'!!!" "Fox Family Dental consistently gives me excellent dental care. I was simply having a six month check-up and cleaning, but they made sure I felt comfortable and even called me to let me know I had an opportunity to come in somewhat earlier than my appointment was set." "You ALL are Absolutely Amazing!!! I LOVE the entire staff! I had an emergency, you got me in, fixed up, and back at work in no time! Simply the BEST!!!!" "I love going to Fox family dental, the staff there is always so friendly, and they always have a smile. They treat you as if they treat you very kind. . The dentist is very honest about what kind of treatments you need and they explain things very well. They do everything to help you keep your beautiful smile. I would highly recommend this place to everyone." "The proof is in the product. The rest comes from the waarm friendly staff. The joy is being able to enjoy a great meal and the company that goes with it because of the good teeth I have and the people who help me keep them that way. The best part is that life is about people, I count myself blessed to tell others about Fox Family Dental. Share the good things in life that you have and make the world a better place. Enjoy. Door to door, all good!"